The view from Pumpkin Bluff, North Caicos. The Pumpkin Bluff region of North Caicos. 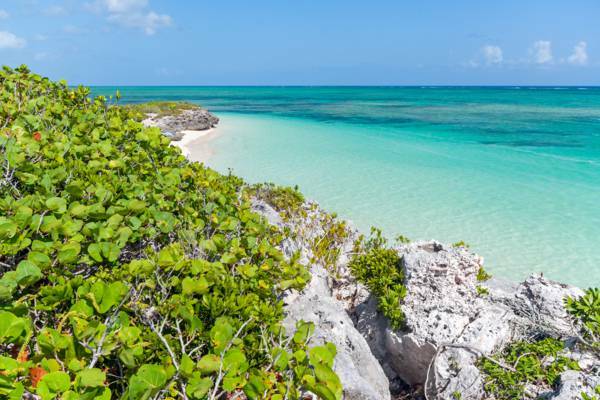 The largely uninhabited region of Pumpkin Bluff is found on the central north coast of North Caicos. A few rental villas stand on the coast and are the only development. Pumpkin Bluff Beach is found at the bottom of the limestone coastal bluffs in the area. Although not an expansive beach, this site has the advantage of typically being free floating seaweed, an issue that many beaches on the island experience. Hollywood Beach is directly adjacent to the west and is beautiful as well. The cave at Pumpkin Bluff that famous early 1900s Dutch anthropologist Theodoor de Booy wrote about. Three land-locked saline ponds are located nearby: Pumpkin Bluff Pond, Whitby Salina, and Mud Hole Pond. The largest of these is Pumpkin Bluff Pond, and it’s a protected nature reserve. A haven for wading birds, flamingos, tri-coloured herons, reddish egrets and great egrets can often be seen here. A track leads around the perimeter of Mud Hole Pond, and during the dry season this trail is quite scenic. 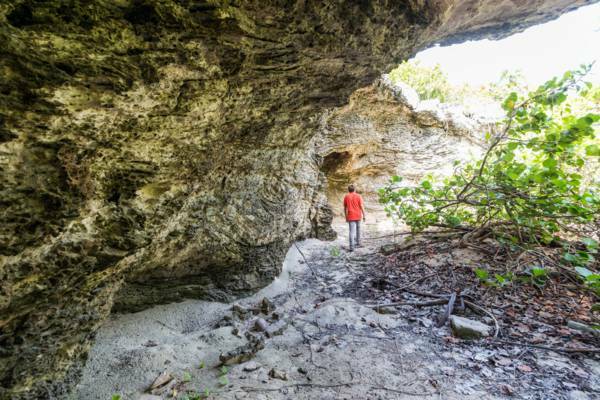 Due to the many pond and sheltering vegetation and hills, Pumpkin Bluff vies with the nearby settlement of Kew and Conch Bar Village on Middle Caicos as the mosquito capital of the country. As is typically the case throughout the country, mosquitoes and sand fleas only become a problem after heavy rains. At most locations, the pesky insects are dissipated by the wind after a few weeks, however, the sites listed above often have lingering problems.